Nater Tot: New (non-toxic) toys! The other day, Nate and I were talking about two friends of his who are sisters. When we talked about the youngest girl, I referred to her as a "baby." Nate knows the older sister is not a baby and asked me what she "was." I told him that she was a little girl, a toddler. I don't think he's very familiar with the word and I told him that he was a toddler too. He proclaimed, "I'm not a toddwer! I'M A NATE! I'm a boy!" This is partially made from plywood, so it's not as solid as I would like - and it's on the small side - but it's been a big hit with Nate. It came with a lot of little accessories, so now Nate serves me the most delicious slices of wooden cheese on a plate, salted and peppered, complete with knife and fork. If I'm lucky, I get a slice of bread or pizza for dessert while he washes the dishes. While I love all of the Green Toys products, they have been very hit or miss with Nate. Luckily, this one is a big hit. 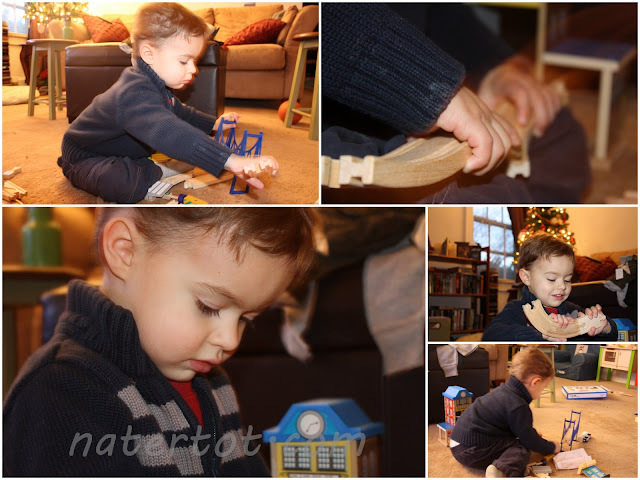 He combines it with his other new tool set for tons of building fun. He likes to put two pieces together and tell me they are "LIZARDS!" Nate absolutely loves his cousin's drill and was desperate to have one of his own. According to this post at The Soft Landing, this set is BPA and PVC free. It comes with a base and interchangeable attachments, like a drill, sander and saw. Nate enjoys sanding and/or drilling holes in my leg. When I scream in mock pain, he rolls his eyes and reminds me that, "Mom, it's only a drill!" What are your favorite toys from the holidays?